The ACL (anterior cruciate ligament) is the main anterior stabilizer of the knee. It is a strong ligament inside your knee that allows you to be able to turn, cut, twist and pivot. There may also be other structures in your knee that are injured at the same time. These may include your meniscus (fibrocartilage cushion in your knee), other ligaments, or the smooth articular cartilage on ends of bone. The treatment plan will be influenced by the combination of structures that are involved, your current activity level and what your desired activity level will be. The final plan of care will be decided upon by you and your healthcare team. The ACL stabilizes the knee joint. It is made of two bundles. The Anteromedial and Posterolateral bundles. If you suspect that you have injured your knee, seek out a qualified physician, physician assistant or nurse practitioner for an evaluation. The knee will be examined to determine the stability of the ACL and other ligaments. Many patients have a large effusion or knee swelling. An MRI scan will be necessary to evaluate the knee. The MRI will give the surgeon detailed information about the ACL, menisci, cartilage and other ligaments in the knee prior to surgery. This is necessary to develop an accurate treatment plan. Some individuals who tear their ACL in an occasional recreational activity, may choose to have only rehabilitation to their knee and may elect not to have surgery. People who decide not to have surgery, usually don’t have a very active lifestyle or participate in sports that require a lot of cutting and pivoting. Most people with this type of lifestyle will be able to function normally without having surgery to reconstruct their ACL. Active individuals often question whether they should have surgery or wear a knee brace. Research has shown that custom and off-the-shelf braces do not protect against further knee injury in the athletic, active population. If you and your physician choose a brace, please discuss the risks of additional knee injuries and the type of brace to be worn. The immediate goal after an ACL tear is the same regardless of treatment options. Patients with isolated ACL tears are required to achieve normal walking, nearly full motion and strength and reduced swelling. For patients that participate in cutting and pivoting sports like football, soccer and basketball, etc., especially at a competitive level, usually elect ACL reconstruction. ACL reconstruction has been shown to prevent re-injury or tearing of your meniscus cartilage. 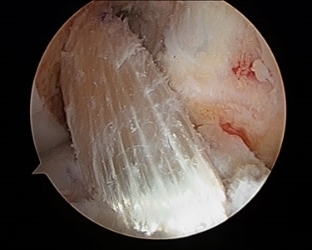 Since a repair (or suturing together) of torn ACL fibers is not effective, another piece of tissue (graft) is chosen by you and your doctor to place within your knee using the arthroscope. Autograft means your own tissue. These choices include your patellar tendon (the tendon from your kneecap to the bottom leg bone) or your hamstring tendons. Allograft tissue comes from a donor. These tissues include either a patellar tendon or other soft tissue including most commonly the hamstrings or Achilles tendon. In younger, more active patients, especially those in competitive sports, either autograft (patellar tendon or hamstring) is the gold standard. Allografts should be avoided because of a three-fold higher failure rate. The exact failure can be predicted from MOON cohort published results. In scientific review of autograft choice, the graft does not influence outcome. Rather, the accurate placement by surgeons, stable initial fixation of the graft, patient compliance and rehabilitation are believed to optimize the results. The graphic below shows ACL retear rates based on age and graft type. This graphic shows the higher rate of failure of an Allograft in young patients. We chose either Hamstring or BTB autograft in our younger athletic patients. Patients over 50 yrs may opt for an allograft reconstruction. Your surgeon performs the surgery through the arthroscope. The skin incisions are only for the surgeon to harvest the graft, if you choose autograft, and drill tunnel at the original site of the ACL. The graft is placed within the tunnels and fixed by a variety of choices to provide immediate stability prior to healing and to help stabilize the graft to the bone. The type of activity you want to participate in will help determine when you can return to it after surgery. The other consideration is physiology, which cannot be influenced by anything other than the time it takes to heal. The most important thing you can do is to regain all of your range of motion, your strength and core balance. This cannot be accomplished without exercising your leg. After the biology of healing has been considered and your strength and stability fully restored, you should be able to return to the activity of your choice. Your doctor may, however, recommend lifestyle changes for you if you present with joint changes, such as arthritis or instability that could not be fully corrected with surgery. A common question people ask when returning to sports is whether or not they need a knee brace. Current research has shown that wearing a brace does not decrease chances of ACL re-injury. IN fact, your normal contralateral knee ACL is at the same risk of injury as your recently ACL reconstructed surgical knee. If you and your physician choose a brace, please discuss the risk of additional knee injury and the type of brace to be worn. The rehab team will help you relearn normal movements and pain free activities to meet your particular lifestyle needs. After you have successfully eliminated most of your pain and have returned to your normal function, it is important for you to continue to be involved in some form of orthopedic fitness to ensure continued good physical health and activity levels. You should consider a lifestyle of organized physical activity to help prevent future complications. Below are some data published from ACL research. Currently we predict that about 70% of patients will return to sporting activity after ACL reconstruction. If you will be having surgery, you will have an evaluation with a physical therapist who is a member of the team responsible for your care. The team consists of the doctor, PT and ATC. During the pre-operative rehabilitation you will be instructed on walking as normally as possible, decreasing swelling in your knee, getting your knee to straighten out all the way and getting as much bend back in the knee as possible. Your rehabilitation team will discuss these things with you and show you exercises that will help you get ready for surgery and make your post-operative therapy easier. Prior to your surgery, you may be instructed to perform a series of exercises in order to build up your strength and maintain normal motion. This will greatly help your recovery process after surgery. Please perform all of the following exercises 1 to 2 times a day, 3 sets of 10 repetitions for each exercise. You must be able to demonstrate normal gait or walk without a limp. Some of you, however, due to the extent of your injury, will be instructed to stay on your crutches. You must obtain at least 120 degrees of flexion or bend. Next, you must have minimal swelling. You can achieve this by using an ice pack with elevation for 15-20 minutes, 3-5 times per day. After surgery you will be given a written instruction sheet, pictures of your surgery, a prescription for therapy and a copy of rehabilitation guidelines. This information will help answer most of the questions you may have during your recovery. You will be going to physical therapy (PT) after your surgery. At the initial evaluation you will meet the PT who, along with an Athletic Trainer (ATC), will be responsible for your rehabilitation. During this visit, you will be instructed in Phase 1 exercises, wound care and how much weight you should place on your operated leg. In addition, your therapist will ask you to help set your goals for rehabilitation. If you have an ACL reconstruction, with no meniscal repair, you will be weight bearing when you are able to feel your leg again after surgery. If you have a meniscal repair, along with your ACL reconstruction, you will be on crutches longer as guided by your surgeon. The entire rehabilitation process will take 5 to 6 months. During the early phase of your rehabilitation, you will be closely monitored. As you progress, you will be able to do more exercises on your own. If you have any questions concerning your rehabilitation process, they should be directed to your rehabilitation team. Step up to the first step; remember the good foot goes up first! You will be given two prescriptions: one for pain, which is a codeine derivative and should be taken if necessary; and one to control inflammation, which should be taken as directed. Leave your dressing on unless your first post-op doctor or therapy visit is more than 48 hours after your surgery. After 48 hours, you may remove your dressing. You may shower 48 hours after surgery and get your incisions wet. DO NOT immerse in a tub or pool for 7-10 days to avoid excessive scarring and risk of infection. Keep Aircast on at all times, exchanging or refiling with cold water every hour while awake. Icing is very important to decrease swelling and pain and improve your mobility. After 24 hours, continue to use the cuff 3-4 times a day, 15-20 minutes each time to keep the swelling to a minimum. You were given an injection to block the conduction of your femoral nerve, which conducts pain and controls your quadriceps muscle. Therefore, you should be relatively pain free, but have little control of your leg. Rest and elevate your leg for the first 24 hours. DO NOT place a pillow under your knee. Elevate with a pillow under your calf and ankle. It is important to get your leg as straight as possible as soon as possible. Call your physician’s office (see business card attached) Monday through Friday during normal business hours if you experience severe pain that is not relieved by your medicine or you experience a temperature over 101.5 degrees, redness or swelling in your thigh or calf. The MOON group is made up of 13 clinic-scientists at 7 sites throughout the country. MOON’s unique structure enables it to answer previously unsolvable orthopedic and sports medicine questions. Its members have joined together to study the long-term outcomes of patients who undergo ACL reconstruction. Your MOON post-op rehabilitation program has been designed by a team of expert physical therapists and physicians with the #1 goal being a safe and quick return to your pre-injury activities. Physical Therapists are healthcare professionals who evaluate and treat people with healthcare problems resulting from injury or disease. In today’s healthcare system, Physical Therapist are experts in the examination and treatment of musculoskeletal and neuromuscular problems that affect daily functional abilities, as well as recreation/sports abilities. Physical Therapists access joint motion, muscle strength/endurance and performance of activities required in daily living. The minimum educational requirement is a post –baccalaureate degree from an accredited education program. The majority of programs offer a master’s degree, but a growing number of programs offer the Doctor of Physical Therapy (DPT) degree. Candidates must pass a state administered national exam, as well as maintain annual continuing competency/licensure requirements. This information is intended for education of the reader about medical conditions and current treatments. It is not a substitute for examination, diagnosis and care provided by your physician or licensed healthcare professional. If you believe that you, your child or someone you know has the condition described herein, please see your healthcare provider. Do not attempt to treat yourself or anyone else without proper medical attention. You will have a pre-surgical physical examination before your surgery . This may also include laboratory and EKG. You will have physical therapy appointments before and after surgery. These appointments will be arranged for you by your surgery scheduler and you will receive this information by mail or phone call. If you experience any change in your health between now and the time of your surgery, please inform the doctor’s office immediately. This includes minor conditions, such as a cold, cough or scrape on the knee. 7 to 10 days before surgery, stop taking ibuprofen, NSAIDS, aspirin herbal supplements, glucosamine, diet pills, clopidogrel (Plavix), warfarin (Coumadin), vitamins and fish oil. If you are on a blood thinning medication like Coumadin, Plavix, Xarelto or aspirin, please contact the provider that manages this medication about stopping this medication and restarting it after surgery. Do not stop it unless told to by your provider. It is okay to take Tylenol up to 24 hours before surgery. Have your pain medication prescription filled and leave it at home to be used after surgery. Do not eat or drink anything – including water – after midnight, the night before your surgery. You will be given specific instructions by the provider who performs your pre-surgical physical exam regarding which medications to continue or hold. The morning of surgery: DO NOT take oral glucose-lowering agents. If you are on insulin, it will need to be adjusted or withheld per IMPACT or your pre-surgical testing provider. If you take blood pressure medications like ACE inhibitors, such as, captopril (Capoten), enalapril (Vasotec), Lisinopril (Prinivil, Zestril), quinapril (Accupril): DO NOT take these on the morning of your surgery. Wash the surgical site with antibacterial soap (HIBICLENS) the morning of surgery. DO not use this soap on your face or genitalia. If you are having shoulder surgery, please DO NOT apply deodorant to the affected side and do not worry about shaving. We prefer you do not have any nicks in your skin at the time of surgery. We can clip any hair that may need to be removed on the day of surgery. Please wear loose fitting clothing and comfortable walking shoes on the day of surgery. You may wear underwear to the operating room. You will have a bulky dressing on your leg or shoulder (depending on surgical site) and an ice wrap. Leave valuables at home. Remove contacts, all body piercing jewelry, all other jewelry and all finger and toe nail polish. Bring your crutches to the surgery center, if you are having knee surgery. Your surgery will take place at one of two facilities. Dr. Marshall will discuss this with you at your preoperative visit. You will have general anesthesia for the surgery, which means you will be completely asleep. You will need to have someone with you to drive you home after the surgery; bus/taxi is not acceptable. Gradually return to your normal diet, as tolerated. Alabama Ortho Spine & Sports post-op appointment: please refer to the schedule you were given by the surgery schedulers. If unaware of the appointment time, call (205) 228-7631. You should have an appointment following your surgery.